The image above and the biographical material below are from Wikipedia. Chalmers was born in Stoke Newington, Middlesex, the son of John Chalmers and his wife Julia (née Mackay). He was educated at the City of London School and graduated from Oriel College, Oxford, in 1881 with a B.A. He joined the Treasury in 1882 and served as Assistant Secretary to the Treasury from 1903 to 1907. He was then Chairman of the Board of Inland Revenue between 1907 and 1911, and Permanent Secretary to the Treasury from to 1911 to 1913. 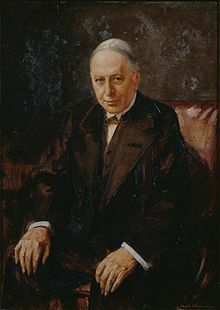 In June 1913 Chalmers was appointed Governor of Ceylon, a post he held from 18 October 1913 to 4 December 1915. He was then briefly Under-Secretary to the Lord Lieutenant of Ireland Lord Wimborne in 1916. He was admitted to the Irish Privy Council the same year. He then returned to the Treasury and served as Joint Permanent Secretary to the Treasury from 1916 to 1919. In 1919 he was raised to the peerage as Baron Chalmers, of Northiam in the County of Sussex. He served as Master of Peterhouse, Cambridge, 1924-31. He spent much of his adult life editing or translating Pali texts. His translations included the Jataka Tales and the Majjhima Nikaya. Lord Chalmers married, firstly, Maud Mary Piggott, daughter of John George Forde Piggott, in 1888. After her death in 1923 he married, secondly, Iris Florence, daughter of Sir John Biles and widow of Robert Latta, in 1935. His two sons from his first marriage, Captain Ralph Chalmers and Lieutenant Robert Chalmers, were both killed in the First World War (within the same month). His daughter Mabel lived until the 1960s. Lord Chalmers died in November 1938, aged 80. As he had no surviving male issue the barony died with him. Lady Chalmers died in 1966. Chalmers was appointed Companion (civil division) of the Order of the Bath (CB) in January 1900, promoted to Knight Commander (KCB) of the order in 1908, and to Knight Grand Cross (GCB) late in his career. He was admitted to the Irish Privy Council in 1916.